The wind turbine project southwest of Manchester is back on track. 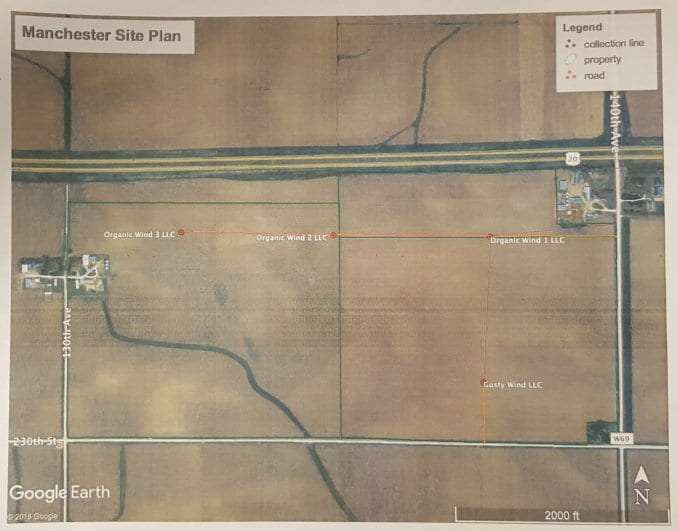 The project is under the direction of Optimum Renewables, the same company that built the three wind towers east of Earlville several years ago. Owner Steve Thompson met with the Delaware County Board of Supervisors on Monday. Thompson says they’d like to pick back up with the project they initiated back in 2016, which involves constructing four wind towers southwest of Manchester. The towers will be located in Prairie Township south of Highway 20 and north of 230th Street between W-69 and 130th Avenue. The permits, which were originally approved two years ago before the project was put on hold, will need to be updated. Construction is expected to start before the end of the year.